Cuevas (left) in January 2016. Manuel Arturo José Cuevas Martínez Sr.
Manuel Arturo José Cuevas Martínez Sr. or just Manuel (born April 23, 1933 in Coalcomán Michoacán, Mexico) is a designer best known for the garments he created for prominent rock and roll and country music acts. Manuel Arturo José Cuevas Martínez Sr was born on April 23, 1933, in Coalcomán de Vázquez Pallares in Mexico as the fifth of twelve children of Esperanza Martínez (1911) and José Guadalupe Cuevas (1901). He attended the University of Guadalajara and majored in psychology. Manuel first learned how to sew in 1945 from his older brother, Adolfo, in Coalcoman, Michoacan, Mexico. "I started making prom dresses when I was 13," says Manuel. "You know that grandmothers and aunts made the prom dresses for all the kids. But I started making prom dresses that were pretty expensive, and all the girls said, 'Mommy I don't want you to make my prom dress. I want Manuel to make my prom dress!' I continued making prom dresses and in one year I made 77 dresses, then the next year I made 110, and from then on I hired people to help me sew. I made a fortune." After his success in making prom dresses in Mexico, Manuel moved to Los Angeles in 1951 and worked for several tailors. He was soon referred to and started working for Sy Devore, tailor to The Rat Pack. Manuel was offered $55 a fitting, which would often only take 15 minutes. Soon he was tailoring suits for elite members of the Los Angeles community including Frank Sinatra, Sammy Davis Jr., Dean Martin, Bob Hope, Don Rickles, and Joey Bishop. Not long after starting to work with Sy Devore, Manuel attended the Pasadena Tournament of the Roses (commonly known as the Rose Parade). He was inspired by the elaborate and flamboyant clothing. Upon learning that the pieces were designed by Nathan Turk, Manuel visited the designer to ask him who was responsible for the embroidery on his clothing. It turned out the embroidery was created by master embroiderer Viola Grae. While still working as the fitter at Sy Devore's, Manuel bartered his sewing expertise with Grae, saying he would cut the shirts and pants for her in return for teaching him the "craft of embroidery." It was through Viola Grae that Manuel met Nudie Cohn, famous for his grand, rhinestone-embellished "Nudie Suits." At first, Manuel made shirts for Nudie. Then one Saturday morning, the great World War II veteran turned actor Audie Murphy came into Nudie's Rodeo Tailors about the fit of some the suits that were being made for his latest film, concerned whether they would be done in time for filming Monday. Manuel worked all weekend tailoring the suits, and Monday morning delivered all the outfits to Murphy. It was then that Nudie offered Manuel the full-time job he wanted. Working alongside Nudie, Manuel would later become head tailor, head designer, and eventually partner of Nudie's Rodeo Tailors in North Hollywood. Clients knew Manuel as the quiet tailor in the back at Nudie's who also did all of the fittings. Manuel designed and created many of the suits that Nudie's Rodeo Tailors became famous for in the late '50s, '60s, and early '70s. Though Nudie encouraged Manuel to make repeat "copies" of designs that sold well, Manuel refused. It was at Nudie's Rodeo Tailors that Manuel became known for his one-of-a-kind designs, making each piece unique. In September 1965 Manuel married Nudie's only daughter, Barbara L. Cohn. They would go on to have a daughter, Morelia (born in 1968). In 1975, after Manuel and Barbara got divorced, Manuel opened his own shop, Manuel Couture, just down the street from Nudie's Rodeo Tailors in North Hollywood. Many of the friends and clients that Manuel made while working with Nudie, including Johnny Cash, Marty Stuart, and George Jones supported Manuel and his new shop. From 1975 till 1988, Manuel Couture became the "go-to" designer and image maker for up-and-coming musicians in Los Angeles. "His customers seem to place a near-blind faith in Manuel putting their professional images in his hands, believing that what he whips up for them will be right. 'That's partly why I have survived as a designer all these years. People put their trust in me to create something truly unique,' he says." Throughout his North Hollywood career, Manuel also worked closely with famed costumer Edith Head and made costumes for over 90 movies and 13 television shows, including making the jeans James Dean wore in the movie Giant, and Lone Ranger's famous mask. After nearly 40 years in Los Angeles, Manuel Cuevas decided he needed a change. He moved his growing business and growing family (second wife Susan, and three children Morelia, Manny Jr., and Jesse-Justin) to Nashville, Tennessee. "I wanted to see the kids grow healthy and safe, and L.A. started to get a little too tight for me, and too complicated. I am thankful for my time there though because that was the place where I made my career flourish." Cuevas's new design space (located at 1922 Broadway) was as equally historical as his designs. An old Victorian house near Nashville's Music Row was four stories; three were designated for work space with the main floor designated as a showroom and retail space. While in Nashville, with encouragement from the public, Cuevas became interested in designing for the every-day client. In 1989, with the popularity of the California Jacket worn by long-time friend and client Dwight Yoakam, Cuevas offered a limited-edition, similar version of the Hillbilly Deluxe jacket in his Nashville showroom. After moving to Nashville, in the late 1990s, Manuel began creating his 50 State Jacket Collection as his gift back to the United States. He researched details from each of the fifty states to create the one-of-a-kind collection. The collection debuted in 2005 at the Frist Center for the Visual Arts in Nashville. Cuevas says the goal is to eventually donate each state's jacket to that state's museum after it has toured the United States and internationally as a collection. In 2005, in an effort to design for the "average Joe", Cuevas worked with his son Manny Jr. to create a men's and women's luxury, ready-to-wear clothing line featured at New York Fashion Week in 2006. The limited-piece collection was manufactured in Italy and was the first and only time that Manuel produced any clothing outside of the United States. After 25 years at 1922 Broadway, Manuel decided he needed to be closer to downtown Nashville and more open to the public. Manuel American Designs opened its new 3,100-square-foot retail space located at the corner of 8th and Broadway, a foot-traffic-heavy spot close to the Country Music Hall of Fame, the Ryman Auditorium, and the Lower Broadway honkytonks. Manuel American Designs officially opened at 800 Broadway in Nashville, Tennessee, in September 2013. On January 24, 2014, Manuel and Maria Salinas Del Carmen surprised Nashville with a "quickie" wedding at the Davidson County Courthouse. This is Manuel's fourth marriage. Manuel still lives just outside Nashville, and continues to design at his 800 Broadway showroom in downtown Music City. His client list continues to grow and includes but is not limited to: all four Hank Williams, Waylon Jennings, Porter Wagoner, John Wayne, Clayton Moore (the Lone Ranger), Dwight Eisenhower, Little Jimmy Dickens, John Lennon, Loretta Lynn, George Jones, Glen Campbell, Ernest Tubb, Gene Autry, the Osmonds, David Cassidy, Bobby Sherman, Dolly Parton, Linda Ronstadt, Emmylou Harris, Roy Rogers, Neil Young, Elton John, The Grateful Dead, The Rolling Stones, Bob Dylan, George H. Bush, George W. Bush, the Bee Gees, Janis Joplin, Jimi Hendrix, Catherine Bach (Daisy Duke), The Jackson Five, John Travolta (Urban Cowboy), Robert Redford (The Electric Horseman), Robert Taylor, Marlon Brando, Burt Reynolds, Raquel Welch, David Lee Roth, Jack Nicholson, Sylvester Stallone, Shooter Jennings, Kid Rock, The Killers, Jack White, Kenny Chesney, Randy Travis, Alan Jackson, Tim McGraw, Keith Urban, Zac Brown Band, Miranda Lambert, Jon Pardi, Frankie Ballard, Matt Wilkinson, and countless others. "Record companies call me to help fabricate personalities for their artists ... I do for artists what they need, not what they think they need." Manuel designed a shirt for famed artist Salvador Dalí while working with Viola Grae. Upon receiving the shirt, Dalí looked in the mirror and says "What kind of flower is this?" Manuel said, "That is a Hispanic flower." Dalí knew Manuel was kidding and said "I've got to do something for you." He then scribbled a drawing of the two of them as they stood in front of the mirror, and Dalí then gave the original piece of art to Manuel as an impromptu gift. Manuel is attributed as being the man who put Johnny Cash in black. It was early 1956 and Johnny Cash was just about to go on tour. He called Manuel and said I would like to have nine new suits. Three months later Cash calls Manuel and says "I got the suits I ordered from you." "Good," Manuel said. "Are they all right?" Cash paused. "How come they're all black?" "They're all black," Manuel said, "but they're not all the same style, you know." "Yes," Cash said. "So?" "So, OK, let's try it." Cash tried it and kept ordering from Manuel for 40 years. "I want four of this, four of that, but you..." Cash would say. "You know what?" Manuel responded. "Black," Cash stated. Longtime friend and client Marty Stuart made his first pilgrimage to Hollywood and Nudie's in 1974. He said he'd saved up $250 and was intending on buying an outfit. When he tried on a jacket that he liked, Nudie calmly informed him it that it cost $2500. Then Manuel stepped in. "He said," Stuart remembered, "'Someday, you will walk in here and buy the whole store. But today you get a free shirt." Not only has Marty Stuart purchased countless Manuel suits, but he has also one of the largest and most significant collections of country music memorabilia aside from the Country Music Hall of Fame and Museum in Nashville. The collection includes his personal Manuel suits, along with the Manuel suits, Nudie suits, and Nathan Turk suits that were worn by some of country music's most influential musician's. Manuel and Dwight Yoakam collaborated for about 15 years to come up with his signature, "Hillbilly Deluxe" look featuring low-slung tight-fitting jeans and sparkling arrow-stitched embroidered jackets. "In Dwight's case, he is no dummy, he knows exactly what he wants." Manuel says. "He said he wanted some of those short jackets from the 50's, the boleros, so I made him one of those. We got about 3,000 calls for that jacket, they have become very popular again. He has a great respect for his older peers, like Buck Owens, Hank Williams Sr., and Ernest Tubb, so this 'new style' of his is a blend of the retro and the new. "I can't say enough good things about Dwight." Likewise, Yoakam says: "Manuel always sets aside his ego and lets me be a part of the creative process. I'll talk about what I like and he'll sketch it. He never copies; everything's an original. I still wear the hat he blocked for me 10 years ago. It has become a good luck hat." In the late 1950s, Colonel Parker brought in $10,000 and a young man into Nudie's Rodeo Tailors, requesting that Nudie makes something special for him. Elvis' signature gold lamé suit was created. On the day Elvis and Colonel Parker came to pick up the suit, Manuel is quoted as saying "I wasn't thinking and thought I must press the suit and since it was a gold lamé, it wrinkled like the face of a modern Keith Richards." When asked for new concert wear for Elvis Presley, Manuel asked for a demonstration of his stage moves. After watching much hip shaking and thrusting, Manuel confesses he thought, "Oh God, I don't know what I'm going to do. But then I had the idea to make a jumpsuit. Elvis said, "What is this? Overalls? 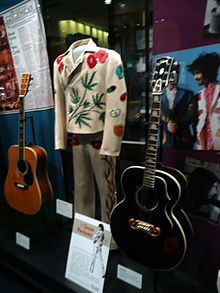 But then he put it on..."
Gram Parsons's suit in the Country Music Hall of Fame. For The Flying Burrito Brothers' 1969 The Gilded Palace of Sin album cover, Gram Parsons commissioned Nudie and Manuel to create a suit. Visible on one lapel is the embroidered figure of a voluptuous naked woman. The green leaves featured prominently in the design on the front of the jacket are a marijuana plant, and the red-petaled flowers above them are poppies, the natural source of morphine, opium, and heroin. The suit has been continuously linked to the manner of his death. Parsons was 26 years old at the time of his death, with official cause being an overdose of morphine and alcohol. Manuel has been quoted as saying, "Gram and I discussed his suit in detail for several months before I committed it to fabric. It wasn't until years later looking back that I realized he wanted me to design the suit the way he would want to die. From the pills, the woman, the cross, the poppies to the flames on the pants and of course in the end his body went up in flames in Joshua Tree with our friend Phil Kaufman." 2015 "NAHCC's Outstanding Leadership in Arts & Culture Award" to MANUEL, Presented by the Nashville Area Hispanic Chamber of Commerce (NAHCC) during its Annual Hispanic Heritage Month Gala at Waller. 2009 "Hispanic Entrepreneur Lifetime Achievement Award" presented to Manuel Cuevas, owner and founde of Manuel American Designs of Nashville Tennessee presented by the Nashville Area Hispanic Chamber of Commerce at Nashville Public Television (NPT) studios. ^ a b Watts, Cindy. "Designer-to-the-country-stars Manuel gets married at Nashville Courthouse". The Tennessean.com. Tennessean. ^ a b c d Wynne, Vincent. "MANUEL CUEVAS: WEAVING TOGETHER PSYCHOLOGY AND DESIGN FOR OVER 60 YEARS". muddyrootsrecords.com. ^ a b c Dixon, Chris (2005-09-04). "A Rhinestone Cowboy Who Grabbed Cars by the Horns". The New York Times. Retrieved 23 August 2014. ^ "Marriage of Manuel M. Cuevas to Barbara L. Cohn on September 4, 1965". ^ a b c Quintanilla, Michael (1989-11-10). "Cowboys Get Cool by Design". Los Angeles Times. ^ a b c Hollabaugh, Lorie. "Manuel: A Country Music Treasure is Exhibited at the Frist Center for the Visual Arts". Country Music Online .net. ^ a b c d Lo, Danica (2006-02-09). "Rhinestone Rembrandt- Designer to Stars will Debut Line in N.Y." New York Post. ^ Callaway, Libby. "Thanks to Manuel, Country Stars Still Glitter". CMT News. Country Music Television. ^ a b Jones, Michelle. "Jackets Required". Nashville Scene.com. Nashville Scene. ^ Herman, Valli (2006-02-09). "A Western that is set in New York". Los Angeles Times. ^ Hansen, Lily (2013-11-29). "Manuel's Broadway Storefront". Nashville Lifestyles.com. Nashville Lifestyles. ^ a b c Schulman, Sandra. "How the West is Worn". SunSentinel.com. Sun Sentinel. ^ Oatman-Stanford, Hunter. "Meet the Man Who Made Cowboys Love Rhinestones". Collectors Weekly.com. Collectors Weekly. ^ a b c Smith, Kevin. "The Rhinestone Rembrandt: Manuel". PunkGlobe.com. Punk Globe. ^ "Rhinestone Rembrandt: Tailor to Country Stars". CBSNews.com. CBS News. ^ Morris, Edward. "Tailor to the Stars: Manuel Explains the Importance of Image". CMT.com. Country Music Television. ^ Gilbert, Calvin. "Marty Stuart Displays Sparkle & Twang". CMT.com. Country Music Television. ^ Zimskind, Lyle (2014-06-14). "Framed: The Story Behind Gram Parsons's Famous Nudie Suit". LAMag.com. Los Angeles Magazine. ^ Adams, Cecil (1997-11-14). "What's up with the strange end of country-rock pioneer Gram Parsons?". Straight Dope.com. The Straight Dope. ^ "Father of the Year Awards". BizJournals.com. Biz Journal. ^ "Entrega de Preseas 'José Tocavén 2013'". Lavozdemichoacan.com (in Spanish). La Voz. 19 June 2013. Retrieved 14 October 2014. ^ "DIVERSAS INTERVENCIONES EN LA INAUGURACIÓN DE LA FERIA MUNDIAL DEL TURISMO CULTURAL". PRESIDENCIA DE LA REPÚBLICA. 28 September 2012. Retrieved 9 October 2014. ^ Newell, David L. (2010-04-28). "Manuel: The Star-Spangled Thank You Tour Gilcrease Museum". ^ "Cinco de Mayo parties in Franklin go for tequila world record, honor Manuel and la Hacienda". HispanicNashville.com. Hispanic Nashville. ^ "Nashville Mayor Karl Dean Celebrates Manuel Day". MD-TN Today.com. Mid-TN. ^ "True West's Best of the West 2011 Winners". True West. 2011-01-07. Archived from the original on 2014-05-06. This page was last edited on 26 November 2018, at 19:35 (UTC).